Learn about why children are dying from unsafe water and why Lifewater exists to intercede on their behalf. Mobilize your community to sponsor a well or celebrate your anniversary or birthday with gifts of safe water. Overseas Trip Planning including packing lists, risk management information, and a volunteer trip manual. 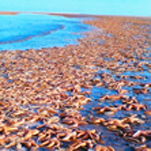 A father and son are walking along a beach full of stranded starfish dying in the sun. The boy periodically stops to throw one back in the water. Finally the exasperated father says "There are thousands dying - why bother throwing a few back"? The son replies, "It makes a difference to the ones I help"! The need is overwhelming, but together we make a difference, one well at a time!